With Good Friday and Easter so close to the April 15 deadline for US income tax filing, let’s take a look at the relationship between your tithe and your income taxes. Malachi 3:10 states “Bring the full tithe into the storehouse, that there may be food in my house. And thereby put me to the test, says the Lord of hosts, if I will not open the windows of heaven for you and pour down for you a blessing until there is no more need.” The Lord directs each of us to tithe, or give the first tenth of our income to His church. Often we hear of legal debates surrounding separation of Church and State. The Internal Revenue Code recognizes churches as qualified organizations and allows tax deductions for donations to churches. I’ve heard from many taxpayers over the years about their donations to the Church. Many times, I hear, “I put X amount in the collection plate every week“. My first piece of advice on tithing is this – you don’t tithe by putting cash in the collection plate. In order for a donation to be tax deductible, any donation to a charitable organization that exceeds $250 needs to be acknowledged by that charity. You need documentation on the charity’s letterhead acknowledging the amount of your donation. From the Internal Revenue Code perspective your tithe is a donation. From God’s perspective, we are instructed to give a tenth of our income as a tithe. In order to receive the proper acknowledgment of your donation from the church you should make your tithe by check to the church or through the church’s e-giving. 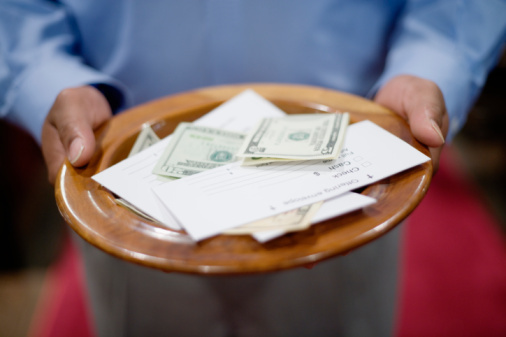 If you’re dropping some bills in the collection plate when it passes, I’d venture your donating to the church, you’re not truly tithing. And you may not receive the necessary acknowledgement from the church to deduct your giving on your taxes. Now let’s look at a tax strategy around tithing. 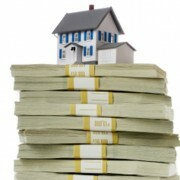 In the Washington DC metropolitan area the median income is $90,000. For example, Denise makes $90,000 as an employee. Denise rents an apartment and typically claims the standard deduction on her tax return. She doesn’t have any major medical expenses, and donates on average of $20 a week in the collection plate and another $500 during the year to various church sponsored charitable activities. Denise has her state withholding taken out of each paycheck which comes to $4,950 for the year. This year, Denise can either claim a standard deduction of $6,200 or itemize her deductions. Denise has itemized deductions. She has the state withholding of $4950. Her donations in the collection plate added up to $1040 for the year; if the church has provided her a statement on their letterhead acknowledging those donations, she can claim them as a tax deduction. Same with the additional $500 she made to various church sponsored charities. Denise has a total of $6,290 in deductions she could claim as itemized deductions. Now Denise can itemize because the total itemized deductions is greater than her standard deduction for the year. In Denise’s case however, the difference is only $90. For most states, when the state tax is calculated, claiming the standard deduction will result in lower combined income tax. Most states will reduce itemized deductions by the amount of state income tax claimed as a Federal itemized deduction. In Denise’s case, if she itemized on the Federal she would end up saving only a few dollars on the Federal return and it would cost her significant dollars in higher state income tax when she completed the state tax return. So, Denise really has no tax benefit from the $1,040 and $500 in donations she has made to the church this past year. The amount of Federal income tax Denise paid this year totals $15,825. Here is another example. ing taken out of each paycheck and that came to $4,950 for the year. She now has a charitable donation of $9000. She has a total of $13,950 in itemized deductions, greatly exceeding the $6,200 standard deduction. Her Federal income tax bill is now $13,888. Denise has saved $1,937 on her Federal taxes and another $345 on her state income tax. By putting God first and following His instructions to tithe, Denise unlocked tax savings as well. I know what you are thinking……Denise donated $7500 more than before and is only saving about $2000. She’s still out over $5000. Remember, 1 Timothy 6:10 says “For the love of money is a root of all kinds of evils. It is through this craving that some have wandered away from the faith and pierced themselves with many pangs.” I offer up that it’s not about the money. We are all stewards of all God provides us, and he instructs us to give freely the first tenth. Matthew 6:33 “But seek first the kingdom of God and his righteousness, and all these things will be added to you.” I’m merely highlighting that tax benefits will be added to you when you tithe. https://taxbreak.tax/wp-content/uploads/2014/09/Tax-Break-rethink-final-logo.jpg 0 0 Taxbreak-web https://taxbreak.tax/wp-content/uploads/2014/09/Tax-Break-rethink-final-logo.jpg Taxbreak-web2015-03-31 14:42:192015-03-31 15:04:56Your Tithe; Honor God and Reduce Your Taxes? 10 Things You Should Look For When Needing a Tax Professional FBAR: Could Skipping 4 Letters Cost You $10,000?